Anyone that knows me knows I’m a absolute lover of heights! 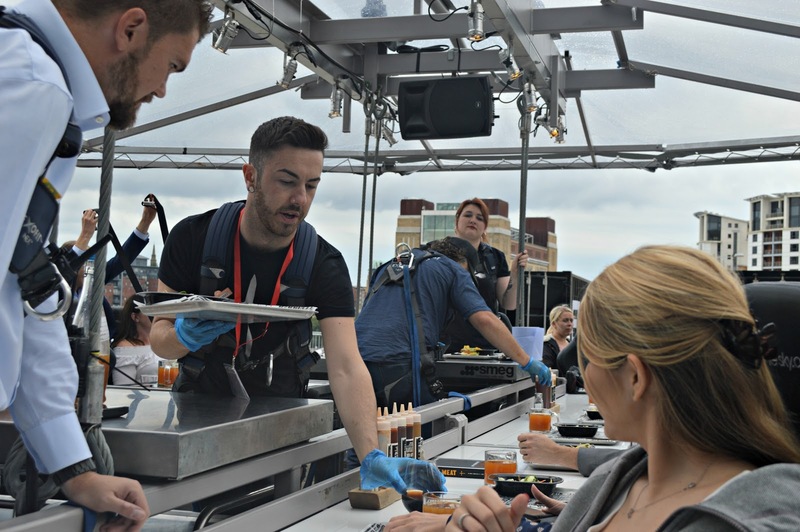 So when I saw this amazing opportunity to go have lunch 100ft in the air with the amazing Newcastle in the Sky team. I knew I couldn’t turn this opportunity down. I first heard of this amazing experience last year when I saw a Rachel from Life in Geordieland talk about it on her blog and I knew I would have to do this one day. It has definitely been on my bucket list ever since and when I saw the crane setting up at the Sage Gateshead I got extremely excited. 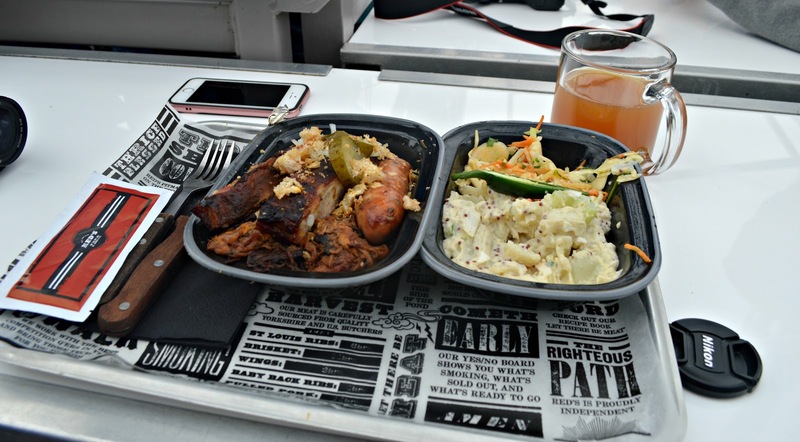 I was lucky enough to be asked to go up for lunch in the sky (4:30pm) with Red’s True Barbecue. We arrived to a champagne reception (for some people I think it helped to calm the nerves) and this was where we got to leave our handbags and coats as they weren’t allowed up in the air. After everyone had arrived we were given a quick briefing which explained what was going to happen and how getting strapped in to our chairs worked. By this point I was extremely excited and couldn’t wait to go up. 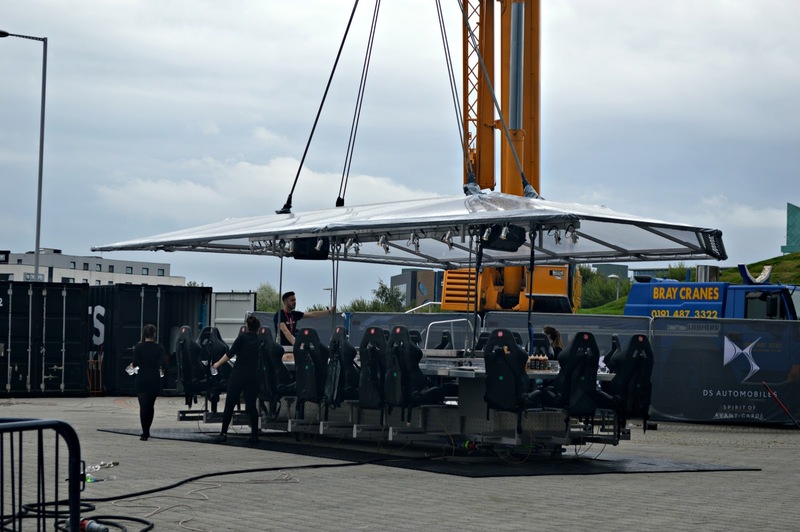 After our briefing we headed over to the platform and shown to our table which is a unique sky table and seats 22 guests with a pop up kitchen in the centre of the table. We were placed near someone we knew and I was very lucky to be spending the night sat beside two of my favourite blogging ladies Gemma from Gemmas Little World and Katie from Katie Jane Online. After being strapped into our chairs (which felt like I was about to go on a rollercoaster) by the Newcastle in the Sky staff we were introduced to our team for the night. 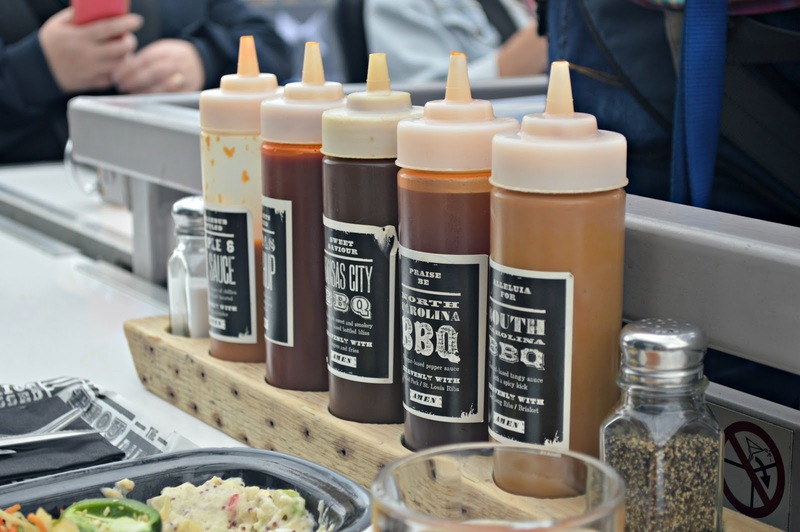 We had 3 members of staff including Head Chef Anthony Hepburn from Red’s True Barbecue which is a American style smokehouse restaurant chain, whose first site was in Leeds in 2012 and is also now has a location in Intu Eldon Square. Head Chef Anthony Hepburn who has worked in the industry for 15 years and his team explained about the restaurant history and menu that we would be tasting up in the air. Potato salad, Buttermilk slaw and Awesome foursome garnish. The food was amazing as you can see from the pictures above but I think the thing that I was most excited about was the view. 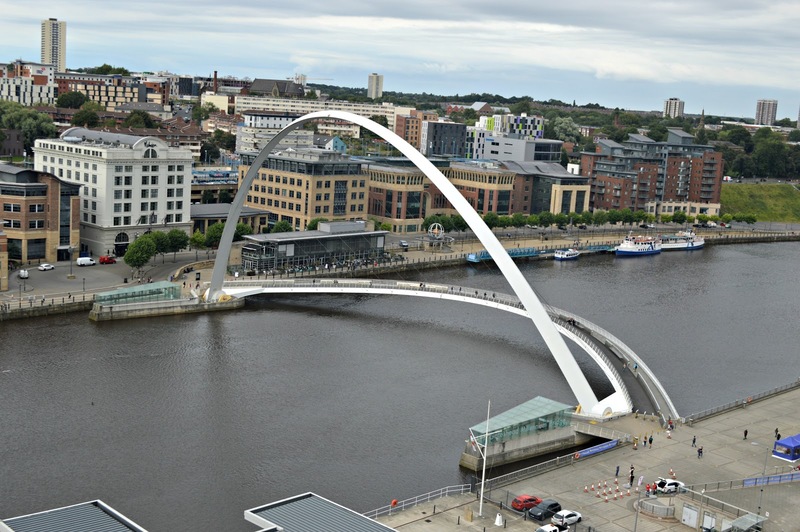 I’ve always been in love with Newcastle and with the Quayside being one of my favourite places to spend my time I was excited to see it from 100ft. I was so excited that I even face-timed Mr M while I was up there! After a small amount of time I learnt that the chairs moved and that you would look out and see the Millennium Bridge it all its glory which I think was one of my favourite parts of the lunch. 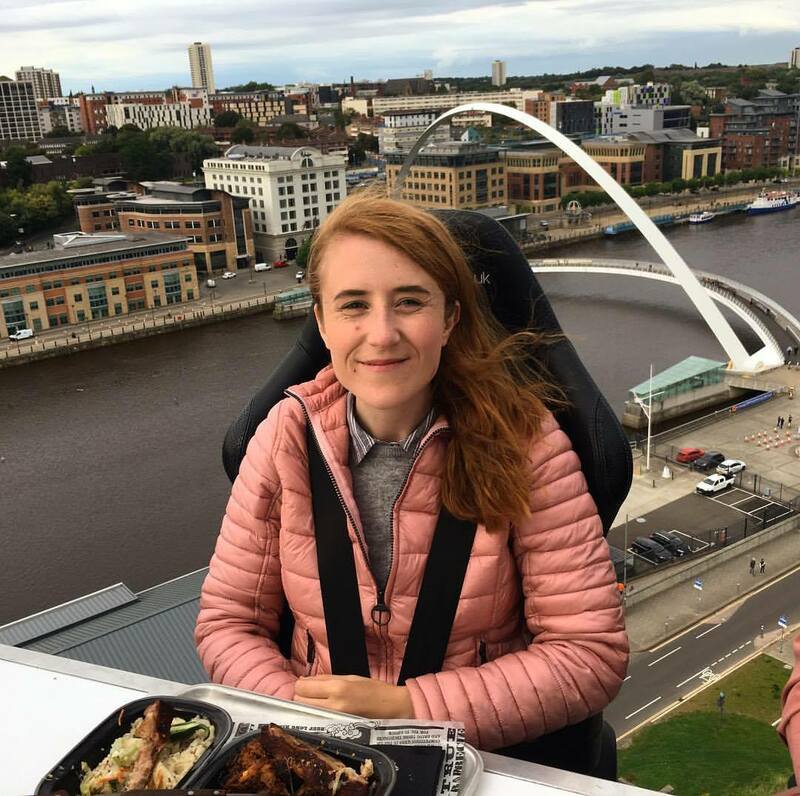 Like I said above I was lucky enough to go for Lunch in the sky but Newcastle in the Sky were offering a range of different types of sitting that you can do in the future. You can have Breakfast in the Sky, Lunch in the Sky, Champagne in the Sky, BBQ in the Sky, Dinner in the Sky and Finally Cocktails in the Sky. They range in prices and you can choose from a variety of restaurants depending on the sitting you wish to do. You sitting is around 45 minutes which is enough time to eat your food and to take in the beautiful views. This opportunity was gifted in exchange for a blog post. All opinions are my own.